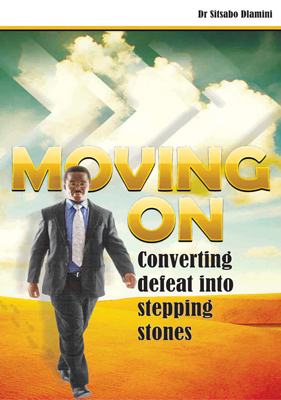 ‘Move On – Converting Defeat into Stepping Stones’ is an inspiration themed book by Dr – and Reverend – Sitsabo Dlamini, on overcoming hardships and charting a way for achieving personal and career success. People have encountered difficulties in one way or another; either by losing a job, failing in business or even losing a loved one. The book shares methods that Dr Dlamini devised for investigating one’s difficulties and thus arming one’s self with strategies to achieve success. “This book is essential reading for men and women looking for strategies to turn defeat into stepping stones towards victory, in their pursuit of success. The strategies discussed have been put to practical test by thousands of people from all walks of life,” says Dr Dlamini. Move On is a memoir detail of Dr Sitsabo Dlamini‘s trial filled journey as young poor boy in apartheid South Africa; from self funding his architecture diploma, charting a professional life, finding Christ, upgrading his academia studies and starting a construction management business — both in South Africa and the UK. We are all vulnerable to the forces and decisions that have derailed too many. The book investigates and gives answers as to why do some people succeed and not others, why and how do problems and opportunities emerge. He says his own experience of being involved in trials and tribulations of his professional life led him to the observation that much of what is taught in schools is sometimes of little value in connection with the business of earning a living. Dr Dlamini says the book followed the approach characterised in his PhD research, which he reckons offers robust theories and strategies of what causes things to happens and why. “Applying myself to the strategies and theories has yielded moving testimonies of success for me in every sphere of my life. They deal with facts that have been applied for personal benefit by many successful men and women. Some created fortunes using the strategies. Others employed the strategies to create harmony in their homes,” he further adds. For purchases of Dr Sitsabo Dlamini’s books, contact Londiwe Shabangu on adminmngr@sitsabo.co.za or 082 221 2081. For media enquiries contact Tiisetso on +27 72 744 6142 or tiisetso@bulabuka.co.za.